On the world stage, the Robert H. Smith Center for the Constitution has cast a wide net, hosting a variety of international audiences. Among these groups are teachers, museum curators, non-profit leaders, elected and appointed officials, and human rights lawyers. One of the ways the Center hosts international groups is through the International Visitor Leadership Program (IVLP). IVLP is the U.S. Department of State’s premier professional exchange program. Through short-term visits to the United States, current and emerging foreign leaders in a variety of fields experience this country firsthand and cultivate lasting relationships with their American counterparts. Professional meetings reflect the participants’ professional interests and support the foreign policy goals of the United States. The map below shows the breadth of the Center's international impact. 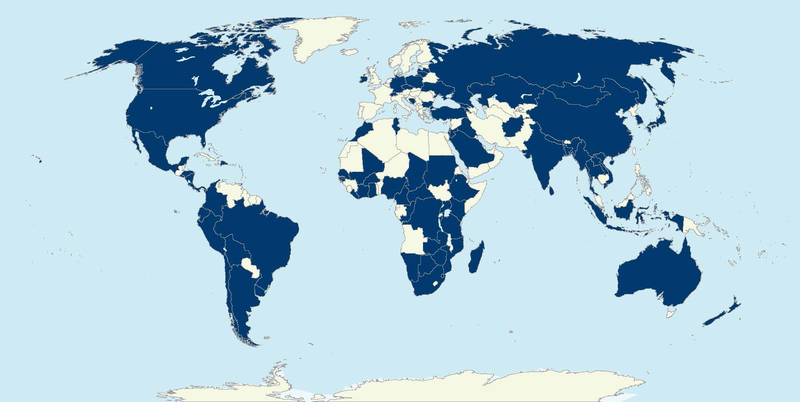 Countries served are in blue. Montpelier also hosts international visitors through the Presidential Precinct, a non-profit that unites two of America’s premier universities, William & Mary and the University of Virginia, William Short’s Morven, and the homes of three Founding Fathers, Thomas Jefferson’s Monticello, James Madison’s Montpelier, and James Monroe’s Highland. Presidential Precinct programs empower leaders to learn from world history, find expert advice, exchange ideas, access professional development resources, and solve the most pressing challenges in their communities. For more information, contact Raquel Suarez at rsuarez@montpelier.org.